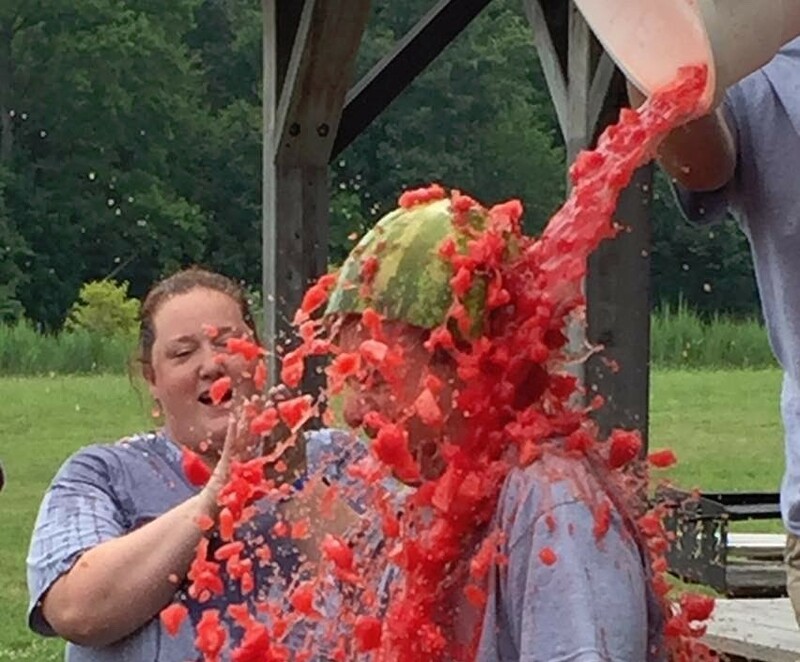 Larry Kaplan enjoys a watermelon shower at his 50 in 30 stop in Delaware. In 1993, major league baseball pitcher Curt Schilling entered a sports memorabilia store owned by Larry Kaplan for a signing event. Schilling, a public advocate for the fight against ALS, inspired Kaplan to make a difference by joining the struggle. Ever since then, Kaplan has been working at ALS fundraising events and volunteering at his local ALS Association chapter in Pennsylvania, trying to do his part to combat the disease. This summer, Kaplan takes his fight to the streets — or, more specifically, the highways of America — as he travels to all 50 states, the contiguous 48 by car and Alaska and Hawaii by plane, to execute his own twist on the ALS Ice Bucket Challenge that swept the nation in 2014. His journey, dubbed "Larry's 50 in 30 Challenge," began in Delaware on Aug. 1, and is set to wrap up in his home state of Pennsylvania the evening of Aug. 30. At each of his stops, Kaplan plans to soak himself in a bucket of some substance representative of the state's culture and production focus. In Boston, Massachusetts, he was bombarded by baked beans. In Connecticut, he endured a cascade of nutmeg. New Jersey saw him take a smattering of blueberries to the head. This Saturday, Aug. 13, Kaplan will make his one and only Inland Northwest stop in Coeur d'Alene (he's chosen Seattle as his Washington destination). The event, taking place at 4 pm at Becker's Tackle Shop, will see Kaplan douse himself in locally made huckleberry lemonade. It'll also serve as the kickoff event for Coeur d'Alene's annual ALS fundraiser walk, which will depart from City Beach on Sept. 17, with a 10 am registration time. Spokane residents looking to get involved in the fight against ALS closer to home can participate in their city's fundraiser walk, which meets at Mirabeau Meadows at 10 am on Aug. 27. But for Kaplan, the local fundraising walks weren't quite enough. "He every year could not quite get $100,000 in his walk," says Amara Bates, ALS Association development director for the organization's Evergreen Chapter. "He would come close — $95,000, $97,000 — so he said 'I've gotta get that $100,000 mark.'" Kaplan's 50 in 30 Challenge aims to achieve that goal, counting the running total of proceeds raised at each local event. The Evergreen Chapter is selling fresh huckleberry lemonade at the Coeur d'Alene event, with all the ingredients and materials provided by a sponsor and all money made from sales going to the association. "We would love to be able to recreate the momentum that the Ice Bucket Challenge was able to gain," Bates says. "It was so organic." Whether or not Kaplan's journey raises anything close to that level of awareness for the cause, the challenge looks to prove that the strength of the ALS movement remains high, and to provide some smiles along the way. But perhaps the most impressive and intriguing tidbit of the entire affair: the 50 in 30 website bears the hashtag "EveryAugustUntilACure," signaling that Kaplan's messy adventures may be just beginning.